For generations, cultures around the globe have used the power of music to facilitate and enhance learning, to share stories and perpetuate traditions. 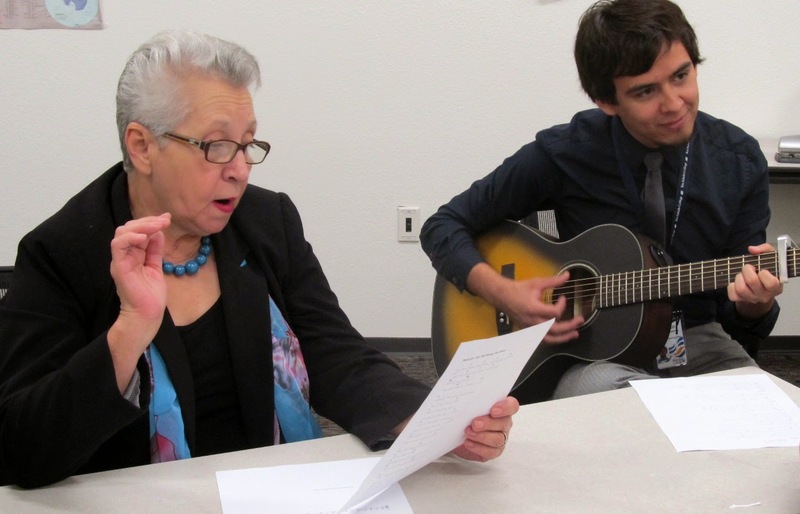 Honoring this approach, Rio Salado College’s Southern location at 3320 S. Price Road, has created a unique musical club where traditional folk music is used to help English as a Second Language (ELAA) students master the English language. Every Wednesday, students gather around as Adult Basic Education Instructor Peggy Lux leads the group in a handful of catchy songs that are geared to help with language comprehension, pronunciation and annunciation. The music club complements the ELAA program, which helps local residents of all skill levels improve upon their written and verbal English language competency. Francisco Alberto De La Torre-Gutierrez, a Rio Salado lab technician and trained guitarist, said he enjoys sharing his passion for both music and English with students. Music club participants represent a diverse network of countries and cultural backgrounds. Socorro Alicia Leon relocated to Phoenix from Guadalupe, Mexico, where she ran her own business for more than 30 years. Khurram Shahzad recently relocated to Phoenix from Pakistan and embraced the opportunity to combine learning English and music. “It was something I really wanted to learn, and when the opportunity was offered to students at this location for free, I couldn’t wait to sign up,” said Shahzad, who was also inspired to take up the guitar. Music club is available to all students who have completed registration at the RSC Southern location, at no additional cost. To learn more about Rio Salado College’s ELAA program, please visit riosalado.edu/elaa. This story can also be found in some December 13 issues of the Arizona Republic. By Aubrie Artiano, PR Assistant for Rio Salado College. PHOTO 1: Socorro Alicia Leon, Rio Salado ELAA student, participates in music club with Francisco Alberto De La Torre-Gutierrez, Rio Salado lab technician.